What is significant about today’s date, May 27th? Today is the 65th birthday of Jim Koch. Might be difficult to believe but it is true. The founder and head of Boston Beers is now eligible for Medicare! The numbers for Boston Beers, founded by Jim in 1984, are nothing short of amazing! Just in IRI numbers in the MULC channel, the company is up +41% or +$50.7 million! What is interesting is that over 40% of that growth is Angry Orchard Apple, which is +157%. Helping those numbers is the new Rebel IPA which is now a top 100 brand and ranks as the number 10 craft in dollars. You can be sure that ABI and MC would love to have those numbers! As has been noted, Boston’s success has been attributed to a number of key decisions made by Jim in the early years. The company has always been strategically focused and the sales team has executed against those goals. Even with the early struggles, the company kept its resolve and stayed true to their values. Boston Lager not-withstanding, Jim first put feet on the street, or since his sales force was mostly female, one might say it was “heels on the street,” both changed the beer industry. Initially he looked at channels where he could target specific demographics for his beer: airport bars and high-end hotel bars where the customers had limited options and choices. Consumers were attracted to the taste and uniqueness of Boston Lager. The advertising for his beers focused on the quality and ingredients used by Boston. No parties, busses, boats, bikinis, lifestyle, or athletes were used then, or now. The brewery only used the attributes of the brands. It is working for the consumer. Think about what Jim and Boston Beers brought to the industry. One can start with the number of styles and flavors of the beer, and then add the uniqueness of the sampler packs and seasonal beers, and finally, the fact that Sam Adams Light was the first of the sessionable craft beers to market. They introduced malt based teas, stuck with it and added different flavors. After a slow start, the teas now a hot and growing brand. 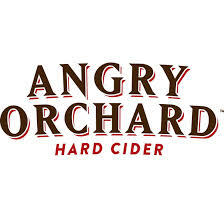 Recently we have seen the fabulous success of Angry Orchard Cider. 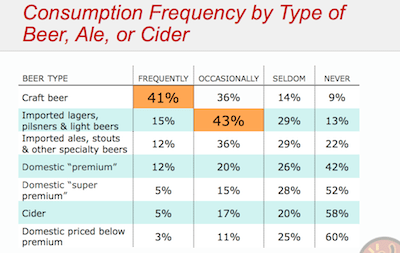 Angry Orchard is by far the leading cider in a very hot category and currently 20% of Boston’s volume. Boston is positioned well to take advantage of future growth. Early numbers for the new Rebel IPA indicate another win for Jim. Rebel IPA has already become the number nine craft in dollars and cracked the top 100 beers overall. This was done in limited distribution! A common question for the industry is “what is the next big trend?” Perhaps the industry should look to Jim Koch for that answer. He might not know, but more than likely the trend will come from his company, in fact it might be on his desk at this moment. After leading Boston Beers for 30 years, the industry can count on Jim Koch to continue to lead his brewery. Let all of us raise a beer to Jim today on his 65th birthday, May 27, 2014! For a number of years the only publicity the beer industry received was either Forbes or Fortune magazines. These highly respected business publications wrote mostly about AB and Miller (part of Philip Morris) and how they were dominating the industry. Other beer topics that were included in these publications were Stroh Brewing buying out Schlitz, G.Heileman and its challenges, and Coors Brewing with their eastern expansion. It was not until Jim Koch and Fritz Maytag began to see success that the media started noticing the coming of craft beers. Add in Michael Jackson, who made a good career talking and writing about first, beer styles, and later, the craft industry. The consumer began to take notice, but it really was not until the coming of the internet, that allowed the consumer access to the education of beer styles and the brands of the world. The NBWA’s public relations campaign for decades really focused on informing Washington of the economic impact of beer wholesalers. A hot topic was how many people were directly and indirectly financially affected using payroll dollars and how much tax dollars were paid, which helped to fight additional tax increases. Not much else. Distributors were known in their home markets for their support of worthy causes, charitable events, sports teams, and hosting organizations at their hospitality facilities. Usually the larger the distributors market share, the more involved in the community was the distributor. Outside of business publications, the craft brewers really struggled to get out their message. Their early attempts with state legislators usually fell on deaf ears and led nowhere. Slowly, however, that started to change. Lead by Jim Koch, and soon followed by craft brewers including Sam Calagione, Gary Fish, Larry Bell, Steve Hindy, Kim Jordan, and Ken Harrison, to name a few, these successful craft brewers became media darlings. To the media, their story was compelling, thus leading the public to become aware of the breweries’ stories and these brewers told of the difficulties they were having with the beer laws. Politicians saw all the new jobs being created, the taxes being paid, and the local support of all their constituents for these breweries. They started to pay attention and then these breweries began to get their ear. In recent years, craft brewers began writing books, being interviewed on TV, some have their own shows, and are even writing op-eds in the major papers. They are speaking not only at beer convention, but in other venues as well. They have become “rock stars” and the face of the beer industry today. They are telling their story! With the advent of remarkable growth of local craft brewers, one or more in almost every community, these local brewers have connected with their community on a level the beer industry has not seen since before prohibition. Consumers connect with these brewers. Locals visit these breweries and sample their beer. The consumers hear their story and challenges. They follow their local brewery on social media and talk to them. They become part of them! And the local politicians know this. This is really the personification of “grass-roots” marketing. No matter how the NBWA approaches today’s issues, they are, in fact, losing the PR battle to craft brewers. This is going to continue in the beer industry in the short term and as for the craft brewers, public opinion in this country is everything. When imports started to come to the US market in a big way around 1980, and expand as distributors picked them up, distributors only carried a hand full of cases. Truck loads were usually one case of these and two cases of those. In fact, you could not sell a layer of Corona in a month, much less a pallet, before Modelo changed the bottle to the current clear one. Things soon changed. The largest issue we hear and read about today in the beer industry has to do with wholesaler franchise protection, but perhaps the second topic, which is almost as big as franchise protection, is suppliers complaints about wholesalers’ lack of focus on their brands, which, of course comes back to franchise protection. Either way, it all is coming from the craft segment through industry conferences; publications, including books now written by successful craft brewers; media; and even bloggers. As we all know, the craft segment growth is nothing short of amazing, and it even seems that it is accelerating. So the question with imports is what about the silent minority, those long-established imports that still are hanging in there? A number of these are independent and owned by their brewery such as Moosehead USA, Warsteiner Importers Agency, or Paulaner USA. There are many others that fly under today’s radar, many very small, but relevant to a number of small consumers. Most of these brands or companies focus on a specific marketing foothold with which their brands are associated. For example, the German beers plan their marketing calendar around the third quarter which is Oktoberfest. The Oktoberfest celebration now has become a major beer selling event across the country. Typically the third quarter for the German beers generates over 50% of their annual sales. The Oktoberfest season is what motivates distributors to focus on their German portfolio. Japanese beers have sushi bars and Pan Asian restaurants targeted as their primary trade channels. Canadian beers, like independent Moosehead, have the spill over from Canada to help them, but in recent years some breweries have pulled the plug on their US operations. Bavaria Brewing, which had a viable US operation, closed down their US operation and assigned the brands to a California importer. Carlsberg, after years with AB, tried to go it alone, then tried an independent operation, and finally went back to a multi brand importer. Both were unwilling to continue to invest in the US, mostly due to the exchange rate. At conventions such as the NBWA, or even the one-day seminars held by the industry publications, it is all about the crafts. The speakers, the panel discussions, and even the retail stat presentations are crafts and the decline of the US domestics. There is, however, nothing about these small importers. These importers today struggle to make their financial and sales goals, they have small sales teams, but believe in their brands and goals. Many of the importers think they are off distributors radars given the high velocity of crafts….this doesn’t make sense to me. Maybe the industry now looks at these small breweries as the current “bolt-ons” for their trucks with annual volume coming during the “Oktoberfest” time period for each one. 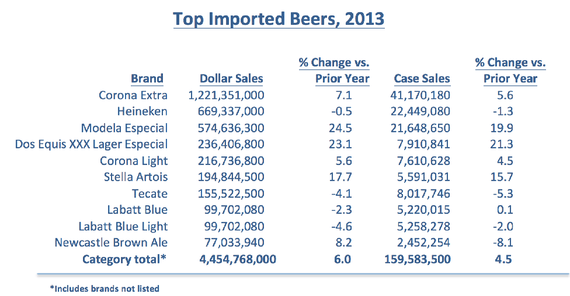 Either way, after all these years, these small but independent importers of beer have become the silent minority. By the late 1960s, beer marketing was limited to brewery reps and wholesaler supervisors calling on bars and buying rounds of beer. Add in hanging p-o-s and you have marketing covered. Outside of AB, no one really advertised much on TV. In fact, even price promotions were rare and Coors did not even do them until the mid-1970s! Then came Philip Morris. When they bought Miller Brewing Co. everything changed. Major media buys woke up AB who jumped in after Miller in an attempt to stem Miller’s growth. This included more and deeper price promotions and themed holiday programs. 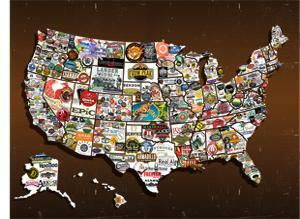 The regional breweries were caught in between and slowly died or sold out. By the 1980s, the industry knew that any brewery needed to do one or both of the following to compete: advertise with media or price promote. The next evolution came when Jim Koch put “feet on the street,” a practice which endures to this day. It was not much later that the internet came into existence, closely followed by social media. Social media, anchored by Facebook and Twitter, is used by everyone in the industry especially crafts, who have benefitted more than anyone in the beer industry by using this technique. For decades the industry was focused on market share and revenue growth. This all changed in 2008 when InBev got its hands on AB. ROI and margin growth became the focus for AB, soon MC followed AB’s lead. This benefited both crafts and wholesalers. Consumers still flocked to the craft segment with no push back on price points. Crafts grew double digits annually while AB and MC lost millions of barrels. 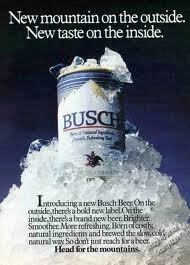 By 1980, Coors had AB down to only a few draft accounts in Wichita, so AB decided to rollout Busch Beer in Kansas. Busch at that time used the tagline, “Head for the Mountains” in their advertising, which played against Coors “Rocky Mountain Spring Water” marketing. AB targeted the college accounts around Wichita State, all of which were exclusively Coors accounts. Their plan? Price half bbls. $2.00 less than Coors. Since we had just introduced Coors Light, it was decided to match the Busch price with Coors Light. Busch never got off the ground, but since all the accounts were exclusively Coors, the bar owners all put in Coors Light! It was not long before Coors Light took off like a rocket. The rest is history. What should be to no one’s surprise, AB is now heavily discounting their craft beers and some import beers in what we all know to be, an attempt to buy back market share. This started at AB-owned distributorships which makes sense. Will an independent AB wholesaler with a large multi-craft portfolio drop their AB craft prices to steal taps from their own in-house craft brands? It is safe to say, probably not, but remember, AB is the largest wholesaler in the US with branches from coast to coast. The question now becomes, just how long will AB continue this discounting? Will crafts follow or will the consumer/retailer switch brands based on pricing? Or, if this discounting has little effect on ABs success in gaining tap handles, will we see even deeper discounting?